Pretty soon that little baby could have babies of her own. Kitties mature young, typically between 4 and 6 months old. As hard as it may be to believe, your 4-month-old little kitten can become pregnant if she has reached puberty by this age. Prevent your furbaby from having unwanted kittens by spaying her early in life. The only way a kitten can become pregnant is if she has gone into estrus, commonly referred to as heat. Your kitty will usually only go into heat during the spring and summer months, although warm, tropical climates can trigger estrus in your kitty all year long, according to the VCA Animal Hospitals website. A mature kitty will begin to yowl loudly and may constantly rub up against you and the furniture in your home. She'll start making attempts to escape your home so she can find a mate outside. You'll also find that she will mark the inside of your home with her urine. She does this to advertise her heat status to available male kitties in the area. The youngest a kitty typically goes into heat is around 3 1/2 months old, according to the December 2001 issue of "Compendium." During her heat cycles, your kitty's periods of estrus last anywhere from three to 16 days at a time, with breaks in between of three to 14 days, according to the Louisiana State University College of Veterinary Medicine. Only during each period of estrus does your little one become capable of reproducing. If she is allowed to mate with an available, mature male cat while in estrus, she has the ability to become pregnant, regardless of how young she is. While she's in estrus, it's important to keep your little one indoors at all times because a brief outing can result in a pregnancy. Your kitty only ovulates when she mates with a male tom cat, which can happen within minutes. She is capable of becoming pregnant during her first period of estrus. This means that your little 4-month-old kitten could give birth to kittens at only 6 months of age. Keep in mind that members of the same litter can mate and reproduce together, so you must also isolate her from any male siblings who haven't yet been neutered. To prevent your little one from having to go through estrus at all or have the possibility of becoming pregnant, have her spayed prior to 3 months of age. 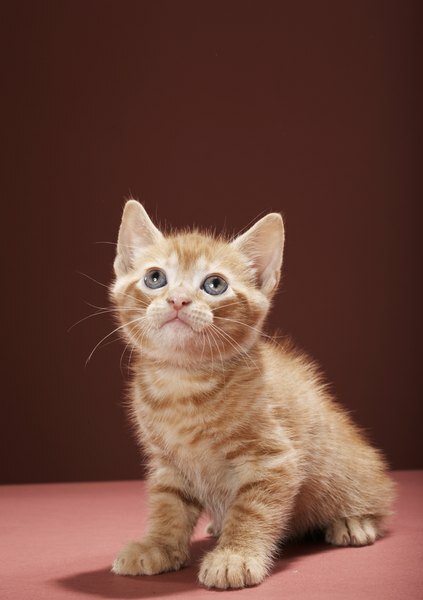 Kittens as young as 8 weeks old can safely be spayed by a veterinarian, as long as they weigh around 2 pounds, according to the American Society for the Prevention of Cruelty to Animals. If your kitty goes into heat, you'll have to wait until her cycle is finished before having her spayed because of the increased risk of bleeding during surgery that can occur, according to Catster. Each kitty is a unique individual and may not go into heat until 6 months or even up to 12 months of age in some cases, according to "The Cat: Clinical Medicine and Management." Kitties allowed to roam freely outdoors are exposed to tom cats and females in estrus, increasing their chances of early maturation. Some breeds like the Burmese mature early, around 4 months of age, while the Persian matures later, closer to 12 months of age, according to "Compendium." To prevent unwanted litters of any breed, it's best to have your furry companion spayed prior to 3 months old. This way you won't have to worry about a surprise litter of kittens from your own little kitten.